5. BIOMEMS: How Microsystems and Semiconductor Industries make money out of the Life Science market ? The deadline for articles, press releases and sponsored White Papers for the next issue of S&T Journal (e-Digest) No.3, Vol.91, March 2008 is 10 March 2008. You can submit your article or press release online. For more information and instructions of preparation click <here>. & Take Advantage of the Early Bird Conference Rates! Produced: by Questex Media Group, Inc.
Make Money out of the Life Science Market ? Microsystems technologies are changing the Life Sciences industry. New in-vitro diagnostic systems, new therapy strategies, genetic disease treatment, targeted and intelligent drug delivery, artificial pancreas, drug discovery processes… are healthcare improvements promised to future generations, enabled by semiconductor and MEMS technologies. The Life Sciences industry already faces critical challenges in addressing this expected market. To take part in this innovation process, it is very important to understand the technology and industrial trends by having a good knowledge of currently used technologies, their limits and advantages, their applications and the way the Life Sciences industry currently works. Indeed, Life Science is a broad field including industries like drug discovery, in-vitro diagnostics, medical devices, instrumentation… In the same way, the market is segmented by applications, technologies and specific medical use. 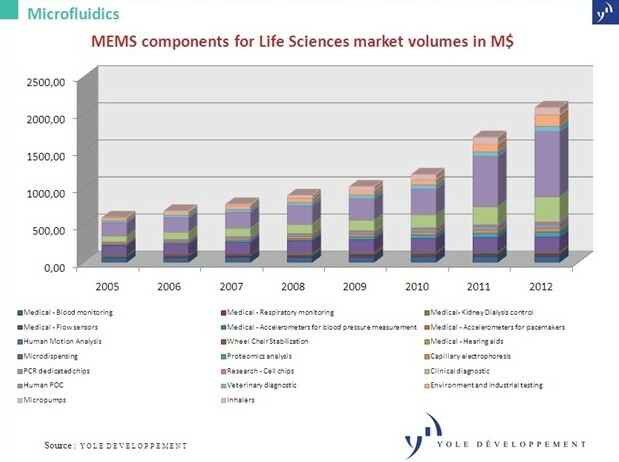 Yole's BioMEMS report answers the question: “How Microsystems and Semiconductor companies can become key suppliers to the Life Sciences field ?"